Alternative energy is any energy source that is an alternative to fossil fuel. These alternatives are intended to address concerns about fossil fuels, such as its high carbon dioxide emissions, an important factor in global warming. Marine energy, hydroelectric, wind, geothermal and solar power are all alternative sources of energy. Europeans had lived in the midst of vast forests throughout the earlier medieval centuries. After 1250 they became so skilled at deforestation that by 1500 AD they were running short of wood for heating and cooking... By 1500 Europe was on the edge of a fuel and nutritional disaster, [from] which it was saved in the sixteenth century only by the burning of soft coal and the cultivation of potatoes and maize. In 1917, Alexander Graham Bell advocated ethanol from corn, wheat and other foods as an alternative to coal and oil, stating that the world was in measurable distance of depleting these fuels. For Bell, the problem requiring an alternative was lack of renewability of orthodox energy sources. Since the 1970s, Brazil has had an ethanol fuel program which has allowed the country to become the world's second largest producer of ethanol (after the United States) and the world's largest exporter. Brazil's ethanol fuel program uses modern equipment and cheap sugar cane as feedstock, and the residual cane-waste (bagasse) is used to process heat and power. There are no longer light vehicles in Brazil running on pure gasoline. By the end of 2008 there were 35,000 filling stations throughout Brazil with at least one ethanol pump. Solar energy is the use of energy from the sun. Heat from the sun can be used for solar thermal applications or light can be converted into electricity via photovoltaic devices. Renewable energy is generated from natural resources—such as sunlight, wind, rain, tides and geothermal heat—which are renewable (naturally replenished). When comparing the processes for producing energy, there remain several fundamental differences between renewable energy and fossil fuels. The process of producing oil, coal, or natural gas fuel is a difficult and demanding process that requires a great deal of complex equipment, physical and chemical processes. On the other hand, alternative energy can be widely produced with basic equipment and natural processes. Wood, the most renewable and available alternative fuel, emits the same amount of carbon when burned as would be emitted if it degraded naturally. Nuclear power is an alternative to fossil fuels that is non-renewable, like fossil fuels, nuclear ones are a finite resource. 2 absorbing tropical rain forests to make way for biofuel production has made it clear that placing energy markets in competition with food markets results in higher food prices and insignificant or negative impact on energy issues such as global warming or dependence on foreign energy. Recently, alternatives to such undesirable sustainable fuels are being sought, such as commercially viable sources of cellulosic ethanol. Biogas digestion harnesses the methane gas that is released when organic waste breaks down in an anaerobic environment. This gas can be retrieved from landfill sites or sewage systems. The gas can be used as a fuel for heat or, more commonly, electricity generation. The methane gas that is collected and refined can be used as an energy source for various products. As an economic sector, there are limited stock market investment opportunities in alternative energy available to the general public. The public can buy shares of alternative energy companies from various stock markets with wildly volatile returns. The IPO of SolarCity demonstrates the nascent nature of this sector- within a few weeks, it already had achieved the second highest market cap within the alternative energy sector. Publicly traded alternative energy companies have been very volatile, with some 2007 returns in excess of 100%, some 2008 returns down 90% or more, and peak-to-trough returns in 2009 again over 100%. In general there are three sub-segments of alternative energy investment: solar energy, wind energy and hybrid electric vehicles. Each of these four segments involve very different technologies and investment concerns. Investors can also invest in ETFs (exchange-traded funds) and mutual funds that track an alternative energy index. In 2010, Mosaic Inc. launched an online platform allowing residents of California and New York to invest directly in solar farms. Photovoltaic solar energy is based on semiconductor processing and benefits from cost reductions similar to those in the microprocessor industry. The economics of solar Photovoltaic electricity are highly dependent on silicon pricing. Because some companies sell completed solar cells on the open market, this can create an irrational pricing environment. Wind power has been harnessed for over 100 years and its underlying technology is stable. Its economics are largely determined by demand, steel prices, and the composite material used for the blades. Because current wind turbines are often in excess of 100 meters high, logistics and a global manufacturing platform are major sources of competitive advantage. Due to rising gas prices in 2008, with the US national average price per gallon of regular unleaded gas rising above $4.00 a gallon, there has been a steady investment in developing higher fuel efficiency vehicles and more alternative fuel vehicles for consumers. In response, many smaller companies have rapidly increased research and development into radically different ways of powering consumer vehicles. Hybrid and battery electric vehicles are commercially available and are gaining wider industry and consumer acceptance worldwide. In 2010, Nissan USA introduced the world's first mass-production electric vehicle, the Nissan Leaf. A plug-in hybrid car, the Chevrolet Volt also has been produced, using an electric motor to drive the wheels, and a small four-cylinder engine to generate additional electricity. For example, electric vehicles (EV) and plug-in hybrid electric vehicles (PHEV) are on the rise. The continue adoption of these vehicles depend on investment in public charging infrastructure, as well as implementing much more alternative energy for future transportation. Solar heat has long been employed in passively and actively heated buildings, as well as district heating systems. Examples of the latter are the Drake Landing Solar Community is Alberta, Canada, and numerous district systems in Denmark and Germany. In Europe, there are two programs for the application of solar heat: the Solar District Heating (SDH) and the International Energy Agency's Solar Heating and Cooling (SHC) program. The obstacles preventing the large-scale implementation of solar powered energy generation is the inefficiency of current solar technology and the cost. Currently, photovoltaic (PV) panels only have the ability to convert around 16% of the sunlight that hits them into electricity. Both Sandia National Laboratories and the National Renewable Energy Laboratory (NREL), have heavily funded solar research programs. The NREL solar program has a budget of around $75 million and develops research projects in the areas of photovoltaic (PV) technology, solar thermal energy, and solar radiation. The budget for Sandia's solar division is unknown, however it accounts for a significant percentage of the laboratory's $2.4 billion budget. Several academic programs have focused on solar research in recent years. The Solar Energy Research Center (SERC) at University of North Carolina (UNC) has the sole purpose of developing a cost-effective solar technology. In 2008, researchers at Massachusetts Institute of Technology (MIT) developed a method to store solar energy by using it to produce hydrogen fuel from water. Such research is targeted at addressing the obstacle that solar development faces of storing energy for use during nighttime hours when the sun is not shining. The Zhangebei National Wind and Solar Energy Storage and Transmission Demonstration Project northwest of Beijing, uses batteries to store 71 MWh, integrating wind and solar energy on the grid with frequency and voltage regulation. In February 2012, North Carolina-based Semprius Inc., a solar development company backed by German corporation Siemens, announced that they had developed the world's most efficient solar panel. The company claims that the prototype converts 33.9% of the sunlight that hits it to electricity, more than double the previous high-end conversion rate. In the 1970s NASA developed an analytical model to predict wind turbine power generation during high winds. Today, both Sandia National Laboratories and National Renewable Energy Laboratory have programs dedicated to wind research. Sandia's laboratory focuses on the advancement of materials, aerodynamics, and sensors. The NREL wind projects are centered on improving wind plant power production, reducing their capital costs, and making wind energy more cost effective overall. The National Renewable Energy Laboratory has conducted various ethanol research projects, mainly in the area of cellulosic ethanol. Cellulosic ethanol has many benefits over traditional corn based-ethanol. It does not take away or directly conflict with the food supply because it is produced from wood, grasses, or non-edible parts of plants. Moreover, some studies have shown cellulosic ethanol to be more cost effective and economically sustainable than corn-based ethanol. Sandia National Laboratories conducts in-house cellulosic ethanol research and is also a member of the Joint BioEnergy Institute (JBEI), a research institute founded by the United States Department of Energy with the goal of developing cellulosic biofuels. From 1978 to 1996, the National Renewable Energy Laboratory experimented with using algae as a biofuels source in the "Aquatic Species Program." A self-published article by Michael Briggs, at the University of New Hampshire Biofuels Group, offers estimates for the realistic replacement of all motor vehicle fuel with biofuels by utilizing algae that have a natural oil content greater than 50%, which Briggs suggests can be grown on algae ponds at wastewater treatment plants. This oil-rich algae can then be extracted from the system and processed into biofuels, with the dried remainder further reprocessed to create ethanol. The generation of alternative energy on the scale needed to replace fossil energy, in an effort to reverse global climate change, is likely to have significant negative environmental impacts. For example, biomass energy generation would have to increase 7-fold to supply current primary energy demand, and up to 40-fold by 2100 given economic and energy growth projections. Humans already appropriate 30 to 40% of all photosynthetically fixed carbon worldwide, indicating that expansion of additional biomass harvesting is likely to stress ecosystems, in some cases precipitating collapse and extinction of animal species that have been deprived of vital food sources. The total amount of energy capture by vegetation in the United States each year is around 58 quads (61.5 EJ), about half of which is already harvested as agricultural crops and forest products. The remaining biomass is needed to maintain ecosystem functions and diversity. Since annual energy use in the United States is ca. 100 quads, biomass energy could supply only a very small fraction. To supply the current worldwide energy demand solely with biomass would require more than 10% of the Earth's land surface, which is comparable to the area use for all of world agriculture (i.e., ca. 1500 million hectares), indicating that further expansion of biomass energy generation will be difficult without precipitating an ethical conflict, given current world hunger statistics, over growing plants for biofuel versus food. Given environmental concerns (e.g., fish migration, destruction of sensitive aquatic ecosystems, etc.) about building new dams to capture hydroelectric energy, further expansion of conventional hydropower in the United States is unlikely. Windpower, if deployed on the large scale necessary to substitute fossil energy, is likely to face public resistance. If 100% of U.S. energy demand were to be supplied by wind power, about 80 million hectares (i.e., more than 40% of all available farmland in the United States) would have to be covered with wind turbines (50m hub height and 250 to 500 m apart). It is therefore not surprising that the major environmental impact of wind power is related to land use and less to wildlife (birds, bats, etc.) mortality. Unless only a relatively small fraction of electricity is generated by wind turbines in remote locations, it is unlikely that the public will tolerate large windfarms given concerns about blade noise and aesthetics. Solar panels are an icon of the 'green power' movement, however the process of manufacturing the quartz based panels can be detrimental to the environment. Raw quartz (silica) used to create solar cells must be mined using harsh chemicals that harm the surrounding environment, as well as those working in the mines. Silicosis is a form of lung disease that is caused by the inhalation of crystalline silica dust resulting in nodule lesions in the lungs. The silica must be cultivated into metallurgical-grade silicon, the process requiring a massive amount of energy as the quartz is placed into electric arc furnaces. The metallurgical grade silica must be processed into polysilicon. This process also produces tetrachloride, a toxic substance that, if not disposed of correctly, can be harmful to the surrounding environment. Hydrochloric acid is formed when tetrachloride interacts with water, lowering water and soil pH. Incidents of tetrachloride spills are common in China, as the production of solar panels has shifted from Europe and the United States to Asian countries within the early 2000s. Because of such, the villagers of Gaolong are unable to leave their homes due to air and soil becoming toxic. This was due to Luoyang Zhongui High-Technology Co. repeatedly dumped tetrachloride in a nearby field for almost a year. ^ Zehner, Ozzie (2012). Green Illusions. Lincoln and London: University of Nebraska Press. pp. 1–169, 331–42. ^ Gregory Clark; David Jacks (April 2010). "Coal and the Industrial Revolution, 1700-1869" (PDF). European Review of Economic History. European Historical Economics Society. Archived (PDF) from the original on 17 December 2008. Retrieved 2008-12-14. Lay summary. Clark and Jacks specifically refer to 18th century "alternative energy"
^ Dr Roger White (2006-05-13). "Trees and Woods: Myths and Realities". Lecture: The Essential Role of Forests and Wood in the Age of Iron. Commonwealth Forestry Association. Archived from the original (doc) on 17 December 2008. Retrieved 2008-12-14. Note: Dr. White specifically refers to coal as a 17th-century alternative fuel in this paper. ^ Douglas B. Reynolds. "Energy Grades and Historic Economic Growth" (doc). Hubbert Peak of Oil Production website. Archived from the original on 22 December 2008. Retrieved 2008-12-14. ^ Norman F. Cantor (1993). The Civilization of the Middle Ages: The Life and death of a Civilization. Harper Collins. p. 564. ISBN 978-0-06-092553-6. ^ "The City's Evolution–From Old Dartmouth to New Bedford, Whaling Metropolis of the World". Old Dartmouth Historical Society. Retrieved 2015-01-30. ^ Alexander Graham Bell (1917). Prizes for the Inventor: Some of the Problems Awaiting Solution. The National Geographic Magazine. National Geographic Society. p. 133. Retrieved 2008-12-14. Lay summary. In relation to coal and oil, the world's annual consumption has become so enormous that we are now actually within measurable distance of the end of the supply. What shall happen when there is no more coal or oil! .... There is, however, one other source of fuel supply which may perhaps this problem of the future. Alcohol makes a beautiful, clean and efficient fuel, and where not intended for human consumption can be manufactured very cheaply from corn stalks and in fact from almost any vegetable matter capable of fermentation. ^ "Industry Statistics: Annual World Ethanol Production by Country". Renewable Fuels Association. Archived from the original on 2008-04-08. Retrieved 2008-05-02. ^ Macedo Isaias; M. Lima Verde Leal & J. Azevedo Ramos da Silva (2004). "Assessment of greenhouse gas emissions in the production and use of fuel ethanol in Brazil" (PDF). Secretariat of the Environment, Government of the State of São Paulo. Archived from the original (PDF) on 28 May 2008. Retrieved 2008-05-09. ^ Daniel Budny; Paulo Sotero, eds. (April 2007). "Brazil Institute Special Report: The Global Dynamics of Biofuels" (PDF). Brazil Institute of the Woodrow Wilson Center. Archived from the original (PDF) on 28 May 2008. Retrieved 2008-05-03. ^ "bioenergywiki.net:Second-generation biofuels". Archived from the original on 2016-03-04. Retrieved 2016-02-07. ^ Including solar and radiant energy. ^ a b Elisabeth Rosenthal (2007-01-31). "Once a Dream Fuel, Palm Oil May Be an Eco-Nightmare". The New York Times. Archived from the original on February 11, 2012. Retrieved 2008-12-14. ^ Lester R. Brown (2007-06-13). "Biofuels Blunder:Massive Diversion of U.S. Grain to Fuel Cars is Raising World Food Prices, Risking Political Instability". Testimony Before U.S. Senate Committee on Environment and Public Works. Archived from the original on 2009-04-04. Retrieved 2008-12-20. ^ "First Commercial Plant". Carbon Recycling International. Archived from the original on 3 July 2013. Retrieved 11 July 2012. ^ a b Center for Solar Energy & Hydrogen Research Baden-Württemberg (2011). "Verbundprojekt 'Power-to-Gas'" (in German). zsw-bw.de. Archived from the original on February 16, 2013. Retrieved September 9, 2012. ^ a b Center for Solar Energy & Hydrogen Research (July 24, 2012). "Bundesumweltminister Altmaier und Ministerpräsident Kretschmann zeigen sich beeindruckt von Power-to-Gas-Anlage des ZSW" (in German). zsw-bw.de. Archived from the original on September 27, 2013. Retrieved September 9, 2012. ^ "Doty Windfuels". Windfuels.com. Retrieved 2012-11-01. ^ "CoolPlanet Energy Systems". Coolplanetbiofuels.com. 2012-10-24. Retrieved 2012-11-01. ^ "Air Fuel Synthesis, Ltd". 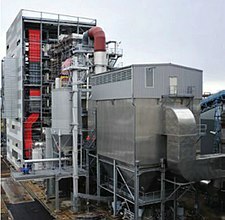 Airfuelsynthesis.com. Retrieved 2012-11-01. ^ Lackner, Klaus S.; et al. (2012). "The urgency of the development of CO2 capture from ambient air". Proceedings of the National Academy of Sciences of the United States of America. 109 (33): 13156–62. Bibcode:2012PNAS..10913156L. doi:10.1073/pnas.1108765109. PMC 3421162. PMID 22843674. Retrieved September 7, 2012. ^ Eisaman, Matthew D.; et al. (2012). "CO2 extraction from seawater using bipolar membrane electrodialysis". Energy and Environmental Science. 5 (6): 7346–52. CiteSeerX 10.1.1.698.8497. doi:10.1039/C2EE03393C. Retrieved July 6, 2013. ^ a b c Pearson, R.J.; Eisaman, M.D. ; et al. (2012). "Energy Storage via Carbon-Neutral Fuels Made From CO2, Water, and Renewable Energy". Proceedings of the IEEE. 100 (2): 440–60. doi:10.1109/JPROC.2011.2168369. Archived from the original on 2015-07-09. Retrieved September 7, 2012. ^ SolarLeaf - bioreactor facade, ARUP Creates First Algae Facade That Produces Energy. ^ "Biomass Briquettes". 27 August 2009. Retrieved 19 February 2009. ^ "Biogas Technology". 27 March 2009. Archived from the original on 25 May 2009. Retrieved 24 June 2009. ^ Hijikata, Tsuneo (2001). "Research and Development of International Clean Energy Network Using Hydrogen Energy". International Journal of Hydrogen Energy. 27 (2): 115–129. doi:10.1016/s0360-3199(01)00089-1. ^ Ghirardi ML; Togasaki RK; Seibert M (1997). "Oxygen Sensitivity of Algal H2-Production". Applied Biochemistry and Biotechnology. 63-65 (1): 141–51. doi:10.1007/BF02920420. PMID 18576077. ^ Radmer R; Kok B (1977). "Photosynthesis: Limited Yields, Unlimited Dreams". BioScience. 29 (9): 599–605. doi:10.2307/1297655. JSTOR 1297655. ^ Gaffron H; Rubin J (1942). "Fermentative and Photochemical Production of Hydrogen in Algae". Journal of General Physiology. 26 (2): 219–240. doi:10.1085/jgp.26.2.219. PMC 2142062. PMID 19873339. ^ Melis A; Neidhardt J; Benemann JR (1999). "Dunaliella salina (Chlorophyta) with Small Chlorophyll Antenna Sizes Exhibit Higher Photosynthetic Productivities and Photon Use Efficiencies Than Normally Pigmented Cells". Journal of Applied Physiology. 10: 515–52. ^ Melis A; Happe T (2001). "Hydrogen Production — Green Algae as a Source of Energy". Plant Physiology. 127 (3): 740–8. doi:10.1104/pp.010498. PMC 1540156. PMID 11706159. ^ Doebbe A; Rupprecht J; Beckmann J; Mussgnug JH; Hallmann A; Hankamer B; Kruse O (2007). "Functional Integration of the HUP1 Hexose Symporter Gene into the Genome of C. reinhardtii: Impacts on Biological H2 Production". Journal of Biotechnology. 131 (1): 27–33. doi:10.1016/j.jbiotec.2007.05.017. PMID 17624461. ^ Renewables 2015. Global Status Report Ren21, retrieved 20th January 2016. ^ a b Horton, Jennifer. (19 August 2008). "5 Wacky Forms of Alternative Energy". Archived from the original on 22 June 2009. Retrieved 15 June 2009. ^ "Hywind by Statoil". 11 February 2009. Retrieved 24 June 2009. ^ McKenna, Paul (5 December 2012). "Is the "Superfuel" Thorium Riskier Than We Thought?". Popular Mechanics. Retrieved 2 March 2015. ^ Rees, Eifion (23 June 2011). "Don't believe the spin on thorium being a greener nuclear option". Guardian. Retrieved 2 March 2015. ^ "SolarCity Stock Market Cap Makes It No. 2 Solar Firm". ^ "Solar Mosaic fully crowd funds its new solar projects in less than 24 hours". ^ Konrad, Tom (2013-01-08). "New Ways to Invest in Solar Like Buffett". Forbes. ^ Bruce Upbin (2007-12-24). "Greenhouse Stocks". Forbes. Archived from the original on 11 December 2007. Retrieved 2007-12-24. ^ "Gas prices post third straight record - Jul. 2, 2008". money.cnn.com. Retrieved 2019-04-22. ^ Foster, Peter (24 Mar 2009). "China takes on America in electric car race." London: Telegraph Media Group Limited. Archived from the original on 27 March 2009. Retrieved 2009-05-11. ^ "2019 Volt: Plug-In Hybrid - Electric Hybrid Car". Chevrolet. Retrieved 2019-04-22. ^ S.C.E. Jupe; A. Michiorri; P.C. Taylor (2007). "Increasing the energy yield of generation from new and renewable energy sources". Renewable Energy. 14 (2): 37–62. doi:10.5772/7379. ^ "Defense-scale supercomputing comes to alternative energy research". Sandia National Laboratories. Retrieved 2012-04-16. ^ Wu, Fan; Cai, Wei; Yeh, Yao-Wen; Xu, Shiyou; Yao, Nan (2016-03-01). "Energy scavenging based on a single-crystal PMN-PT nanobelt". Scientific Reports. 6: 22513. Bibcode:2016NatSR...622513W. doi:10.1038/srep22513. ISSN 2045-2322. PMC 4772540. PMID 26928788. ^ Holm L. (2012). Long-Term Experiences with Solar District Heating in Denmark[permanent dead link]. Presentation. European Sustainable Energy Week, Brussels. 18–22 June 2012. ^ Pauschinger T. (2012). Solar District Heating with Seasonal Thermal Energy Storage in Germany Archived 2016-10-18 at the Wayback Machine. Presentation. European Sustainable Energy Week, Brussels. 18–22 June 2012. ^ Solar District Heating (SDH) platform website. Europe. ^ Solar Heating and Cooling programme, of the International Energy Agency. website. ^ "Improvement of efficiency for solar photovoltaic cell application" (PDF). BRAC University. Retrieved 2012-04-16. ^ Chakrabarty, Gargi. "Stimulus leaves NREL in cold". Denver Post. Retrieved 2012-04-16. ^ "DOE Global Energy Storage Database". www.energystorageexchange.org. Archived from the original on 2017-06-27. Retrieved 2017-05-10. ^ In many context the term "biomaterial" refers specifically to the body-friendly materials in medical implantation, etc. ; here it is used literally. ^ T.A. Volk; L.P. Abrahamson (January 2000). "Developing a Willow Biomass Crop Enterprise for Bioenergy and Bioproducts in the United States". North East Regional Biomass Program. Retrieved 4 June 2015. ^ M.R. Schmer; K.P. Vogel; R.B. Mitchell; R.K. Perrin (2008). "Net energy of cellulosic ethanol from switchgrass". Proceedings of the National Academy of Sciences of the United States of America. 105 (2): 464–469. Bibcode:2008PNAS..105..464S. doi:10.1073/pnas.0704767105. PMC 2206559. PMID 18180449. ^ "Technology: High Yield Carbon Recycling". GreenFuel Technologies Corporation. Archived from the original on 2007-08-21. Retrieved 2008-07-09. ^ NREL. "Geothermal Technologies". NREL. Retrieved 2012-04-17. ^ Sandia. "Geothermal". Sandia. Retrieved 2012-04-17. ^ GFZ Helmholtz Center Potsdam. "International Centre for Geothermal Research". GFZ Helmholtz Center Potsdam. Retrieved 2012-04-17. ^ Huesemann, Michael H., and Joyce A. Huesemann (2011). Technofix: Why Technology Won’t Save Us or the Environment, "Challenge #1: Serious Environmental Impacts of Large-scale Renewable Generation", New Society Publishers, ISBN 0865717044, pp. 125-133. ^ Rojstaczer, S.; Sterling, S.M. ; Moore, N.J. (2001). "Human appropriation of photosynthesis products". Science. 294 (5551): 2549–2552. Bibcode:2001Sci...294.2549R. doi:10.1126/science.1064375. ^ Vitousek, P.M.; Ehrlich, P.R. ; Ehrlich, A.H.; Matson, P.A. (1986). "Human appropriation of the products of photosynthesis". BioScience. 36 (6): 368–373. doi:10.2307/1310258. JSTOR 1310258. ^ Pimentel, D.; et al. (1994). "Achieving a secure energy future: environmental and economic issues". Ecological Economics. 9 (3): 201–219. doi:10.1016/0921-8009(94)90078-7. ^ Hoffert, M.I. ; et al. (2002). "Advanced technology paths to global climate change stability: energy for a greenhouse planet". Science. 298 (5595): 981–987. Bibcode:2002Sci...298..981H. CiteSeerX 10.1.1.362.1539. doi:10.1126/science.1072357. PMID 12411695. ^ Elliott, D.L., L.L. Wendell, and G.L. Gower (1992), "Wind energy potential in the United States considering environmental and land use exclusions", In: Proceedings of the Biennial Congress of the International Solar Energy Society – Solar World Congress in Denver, Colorado, edited by M.E. Ardan, S.M.A. Burley, and M. Coleman, Pergamon, Oxford, UK. ^ Wuestenhagen, R.; Welsink, M.; Buerer, M.J. (2007). "Social acceptance of renewable energy innovations – an introduction to the concept". Energy Policy. 35 (5): 2683–2691. doi:10.1016/j.enpol.2006.12.001. ^ a b Cardwell, Diane. "A Pushback on Green Power". The New York Times. The New York Times. Retrieved February 22, 2017. ^ Porter, Eduardo. "How Renewable Energy is Blowing Climate Change Efforts off Course". The New York Times. The New York Times. Retrieved 26 February 2017. ^ Eunjung Cha, Ariana (March 9, 2008). "Solar Energy Firms Leave Waste Behind in China". The Washington Post.